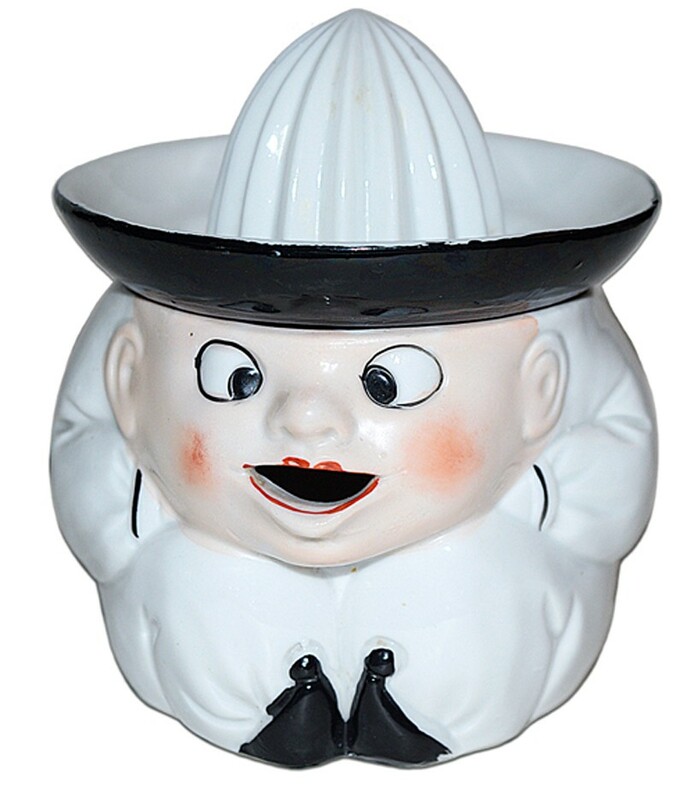 Colors: White Bisque Body with Black Hat and Trim. Red Lips and Pinkish Cheeks. 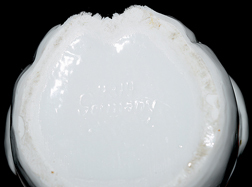 Backstamp: "Germany 48 /4" (please see the photo of the backstamp provided). Description / About: German Clown / Jester Reamer - 4 1/4" H. - 3 3/4" W.
Condition : We are offering for sale a wonderful German Clown or Jester Figural Reamer. We were thrilled to find this fantastic piece. It is superbly hand painted. This little guy is two pieces. 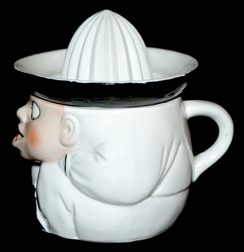 The reamer top (his hat) and the bottom pitcher (you pour the juice from his mouth). This wonderful reamer is in UNDAMAGED CONDITION without chips or cracks. It is free of disfiguring mold or production imperfections. Condition: We are offering for sale a wonderful German Clown or Jester Figural Reamer. We were thrilled to find this fantastic piece. It is superbly hand painted. This little guy is two pieces. 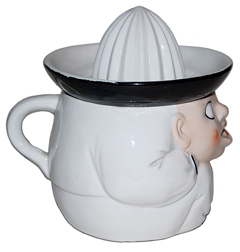 The reamer top (his hat) and the bottom pitcher (you pour the juice from his mouth). 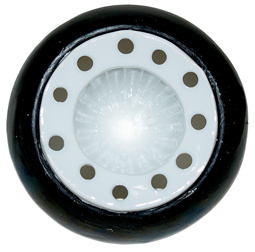 This wonderful reamer is in UNDAMAGED CONDITION without chips or cracks. 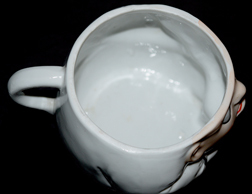 It is free of disfiguring mold or production imperfections. US POSTAGE AND INSURANCE ON THIS ITEM IS CALCULATED. PLEASE REFER TO THE SHIPPING TAB IN THE LISTING.